In January 1956 the world was shocked to hear that a primitive tribe in the rain forest of Ecuador had killed five American missionaries. Jim Elliot, Nate Saint, Ed McCully, Pete Fleming, and Roger Youderian had been working at various jungle mission stations among the Quichua and Jivaro Indians for several years. The men, Protestant missionaries in their twenties and thirties, had been accompanied by their wives. Each couple was eager to share the message of the gospel with those who had never heard it. But, above all, they were dedicated to the Lord himself and sought to be obedient to him in all things. Jim Elliot and his friends had hoped and prayed to be able to make contact with an isolated and hostile people known by other tribes as the Aucas (“savages” in Quichua) because of their fierce infighting and hatred for outsiders. 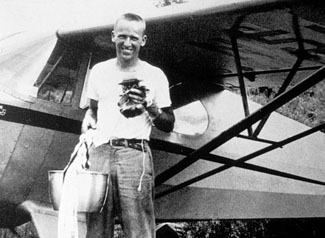 With his skill as a pilot for the Missionary Aviation Fellowship, Nate Saint had made it possible for the men to fly over the Auca settlements deep into the jungle and drop such gifts as cloth, axes, and cooking pots to assure them that their intentions were friendly and to win their trust. The Aucas reciprocated, tying native gifts – a parrot, a headband of woven feathers, manioc, and bananas – onto the plane’s drop-line. 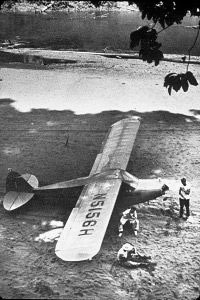 When the mission team landed on the banks of the Curaray River a few miles from the Auca village and set up camp, their hopes were rewarded: Three Aucas came out of the jungle and spent the day at the camp trying to communicate with the men, delightedly taking a ride in the plane, and curiously inspecting the missionaries’ equipment. Two days later, on January 8, 1956, as Nate flew over the camp, he saw a group of Aucas headed toward it through the jungle. He landed near the campsite on the river bank, shouted the news “They’re on their way!” to Jim, Roger, Pete, and Ed, and by radio notified Marj Saint at the mission base of the hoped-for meeting. The next designated radio contact with their wives was never made. The following morning, one of Nate’s co-workers from the Missionary Aviation Fellowship flew over the site in search of the men and located the plane. All of its fabric had been stripped. Later a body was sighted, floating face down in the river, and then another. An armed expedition made up of the missionaries’ colleagues, military personnel, and Quichuas set off on foot, hoping to find the other men still alive somewhere in the rain forest. A few days later, the other bodies, speared and sprawled in the sand and muddy river water, were discovered by helicopter. The ground party recovered four of the bodies and buried them on the banks of the Curaray. The body of the fifth missionary had been identified earlier by an advance party of Quichuas, but was washed away in a storm. “Jim’s aim was to know God. His course, obedience – the only course that could lead to the fulfillment of his aim. His end was what some would call an extraordinary death, although in facing death he had quietly pointed out that many have died because of obedience to God. He and the other men with whom he died were hailed as heroes, ‘martyrs.’ I do no approve. Nor would they have approved. “Is the distinction between living for Christ and dying for him, after all, so great? Is not the second the logical conclusion of the first? Furthermore, to live for God is to die, ‘daily,’ as the apostle Paul put it. It is to lose everything that we may gain Christ. It is in thus laying down our lives that we find them. 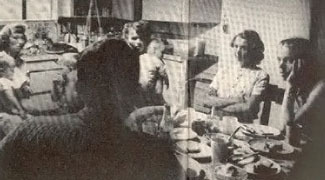 Less than three years after the five men’s deaths, Elisabeth Elliot and Rachel Saint, Nate’s sister, made contact with the Aucas – who in their own language called themselves Huaorani or “the people” – through the help of an Huaorani woman who had earlier fled from her tribe. The Huaorani accepted the two women and Elisabeth’s daughter to live among them because they wondered why the missionaries had let themselves be killed rather than shoot any of their attackers. Then they heard the full story of how the men had come to tell them of Jesus, who “freely allowed his own death to benefit all people. 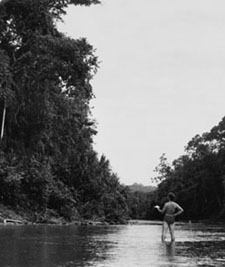 Rachel spent more than thirty years working among the Huaorani. Steve, Nate Saint’s son, often visited his Aunt Rachel and grew up knowing the men who learned to “walk on God’s trail” after they had killed his father. In an unbelievable expression of reconciliation, Steve Saint, Nate’s son, was baptized by two of the men who murdered his father, in the very river where his father died. Steve Saint has worked as a missionary in West Africa, Central America and South America. Jeanne Kun is a noted author and a senior womens' leader in the Word of Life Community, Ann Arbor, Michigan, USA. This article is excerpted from the book, Even Unto Death: Wisdom from Modern Martyrs, edited by Jeanne Kun, The Word Among Us Press, © 2002. All rights reserved. Used with permission. The book can be ordered from WAU Press. “If a man dies, he falls like a tree. Wherever he falls, there he lies. If he is not a believer, he goes to the fire-lake. Their call of God is to the region beyond the ends of civilization’s roads—where there is no other form of transportation. They have probed the frontiers to the limit of physical capacity and prayed for a means of reaching regions beyond—a land of witch doctors and evil spirits—a land where the woman has no soul; she’s just a beast of burden—a land where there’s no word for love in their vocabulary—no word to express the love of a father for his son. In order to reach these people for whom Christ died, pioneer missionaries slug it out on the jungle trails day after day, sometimes for weeks, often in mud up to their knees, while up above them the towering tropical trees push upward in a never-ending struggle for light. It is our task to lift these missionaries up off those rigorous, life-consuming, and morale-breaking jungle trails—lift them up to where five minutes in a plane equals twenty-four hours on foot. The reason for all this is not a matter of bringing comfort to the missionaries. They don’t go to the steaming, tropical jungles looking for comfort in the first place. It’s a matter of gaining precious time, of redeeming days and weeks, months and even years that can be spent in giving the Word of Life to primitive people. May the time never come when mankind no longer hears the soft footsteps of the herald angel, or his cheering words that penetrate the soul. Should such a time come all will be lost. Then indeed we shall be living in bankruptcy and hope will die in our hearts. We continued circling until the gift was drifting in a small lazy circle below us, ribbons fluttering nicely. Finally the gift appeared to be pretty close to the trees below. Once I believe the ribbons dragged across a tree and hung up momentarily. We held our breath while the kettle lowered toward the earth. It hit about two or three feet from the water directly in line with the path to the house. Finally the line was free and there was our messenger of good will, love and faith two thousand feet below on the sandbar. In a sense we had delivered the first gospel message by sign language to a people who are a quarter of a mile away vertically . . . fifty miles away horizontally . . . and continents and wide seas away psychologically. I want you to know that your prayers are being answered moment by moment as regards me—I am ever so conscious of the everlasting arms. As yet we know only that two bodies have been sighted from the air but not identified. Jim was confident, as was I, of God’s leading. There are no regrets. Nothing was more burning in his heart than that Christ should be named among the Aucas. By life or death, oh, may God get glory to himself. Pray that whatever the outcome I may learn the lessons needful. I want to serve the Lord in the future, so pray for his continued grace and guidance. I have no idea what I will do if Jim is dead, but the Lord knows and I am at rest. 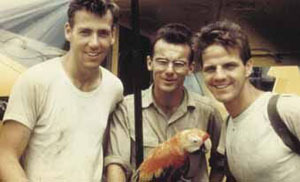 photo of Ed McCully, Pete Fleming, and Jim Elliot together, courtesy of Elizabeth Elliot. Elizabeth Elliot kept a number of photos of Jim and his missionary mates. Some are posted in her books, Shadow of the Almighty, The Savage My Kinsman, and Through Gates of Splendor.